Gwyn Satterlee is this year’s honorary race starter for Run to Fight Children’s Cancer, headed to GCU on March 16. Peek into 7-year-old Chandler resident Gwyn Satterlee’s room and you just might see Groot, stuffed animal version, nicely nestled in a corner. She scoots on her scooter, tongue sticking out. She loves, loves, LOVES animals and wants to be a veterinarian. She looks up to her amazing big sister, Paige. Is all about arts and crafts. Dives head first into the foam-filled pit at her gymnastics studio and smiles. Ear to ear. Her parents, Leslie and Galen, laugh. EVERY time. She’s now just tall enough to reach the sliding door lock to let out the family’s HUGE, lovable dog, a Vizsla named Zoe. She often heads to the backyard fence to chirp, “Hi!” to the neighborhood kids next door who poke their heads over the fence. They tend to do that … a lot. And 2½ years ago, she launched her war against cancer. 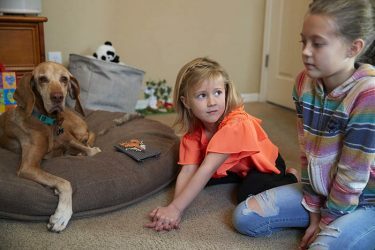 Gwyn, 7, looks up to big sister Paige as they share a moment with family dog Zoe. 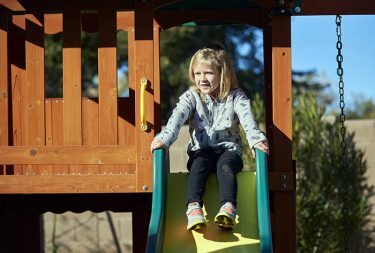 It was June 2016 when Gwyn’s mom, Leslie, noticed that her tornado of sunshine — this year’s Children’s Cancer Network Run to Fight Children’s Cancer race starter — wasn’t quite herself. That – alongside a typical playground injury – was when things started to take a turn. Gwyn had gotten a knock on the forehead while playing softball. Galen said, at the time, “I didn’t know any better,” and wasn’t prepared for the soul-crushing devastation that would follow. One thing that makes Gwyn smile from the time she arrives until the time she leaves is gymnastics practice. The family sped to Phoenix Children’s Hospital, where Gwyn was admitted right then “to what we have since referred to as Hotel 7,” Galen said – the seventh floor of the hospital. The oncology floor. The red dots on Gwyn’s neck, they would find out, were petechiae, a sign of low platelets. It was their reluctant introduction to acute lymphoblastic leukemia, a type of cancer that affects the blood. Leukemia is the most common form of cancer in children and teens, according to the American Cancer Society; one in three cancer cases in children and teens is leukemia. Doctors categorized Gwyn as high risk because of her elevated white blood cell count. The next month was a mind-numbing whirlwind of doctors and medicine and IVs and … the world of pediatric cancer. Leslie Satterlee, Gwyn’s mom, said her daughter’s bright, happy, enthusiastic personality helped her cope with her diagnosis. Her hospital stays totaled about 50 days and nights, she faced 23 painful spinal taps, and she lost her beautiful blond hair. 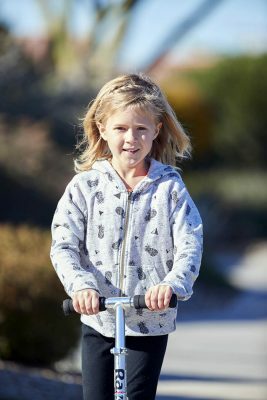 When she was admitted to PCH that first time, Galen said, “She had surgery the next day to place a port, which is where she gets all her medicine. 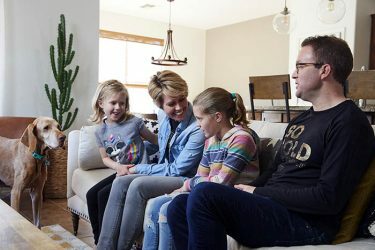 It’s a journey that will continue for the Satterlee family March 16 on the Grand Canyon University campus, where Gwyn will take her place as Run to Fight Children’s Cancer race starter. Organizers choose one pediatric cancer survivor to hold the honorary title and sound the air horn to begin the race. The family — Zoe, Gwyn, Leslie, Paige and Galen — on a sunny January day at home. Gwyn’s finished her cancer treatments in October. The event, presented by host sponsor GCU and grand presenting sponsor Pono Construction, raises funds for CCN and Phoenix Children’s Hospital. According to the National Pediatric Cancer Foundation, only 4 percent of federal government cancer research funding goes to battle pediatric cancer even though it’s the No. 1 cause of death by disease among children. One in 285 children will be diagnosed with cancer, which computes to 43 per day. Despite those numbers, since 1980 fewer than 10 drugs have been developed for use in children with cancer. Since it started, the race has raised more than $600,000 in the fight against pediatric cancer. It was when the Satterlees were waiting for one of Gwyn’s spinal taps that they met the Hyduchaks. Jace Hyduchak, who is the same age as Gwyn, received treatment at Phoenix Children’s East Valley Specialty and Urgent Care Center in Mesa, same as the Satterlees. Jace served as Run to Fight race starter in 2017, and the Hyduchaks mentioned the race and CCN to the Satterlees. As Run to Fight race starter, Gwyn will sound the air horn to start the race. The event will return to GCU for its ninth year. As it turns out, the Satterlees had another connection to the event. Lindsey Gray, mom of 2018 race starter Lily Gray, went to college with Leslie. The Satterlees say they have been lucky – Gwyn’s body responded to treatment as it was supposed to, and she never had to stay in intensive care or go through major, unexpected surgeries. “She hit remission after the 30 days, so she didn’t get bumped up into the even higher (risk) category,” Leslie said, though doctors reluctantly use the word “remission” and look for patients to reach that important five years cancer-free mark. Her treatment ended Oct. 20, but she returns to the doctor for monthly blood tests, the frequency of which decreases as time goes on. Throughout it all, “Gwyn has handled it pretty darn well,” Galen said of his youngest daughter, whose happy personality has allowed her to cope. Not that she talks about what she has gone through. Rarely will she bring it up. “I think she was the one in the family that dealt best with it, more so than us and her older sister. She always just seemed to go with the flow,” Leslie said. The experience has turned Leslie into an advocate, not just for pediatric cancer patients, but for siblings of those with childhood cancer. You’ll often find Gwyn and her sister, Paige, beyond gymnastics and communing with their dog, Zoe, listening to music and watching baking show competitions on TV. 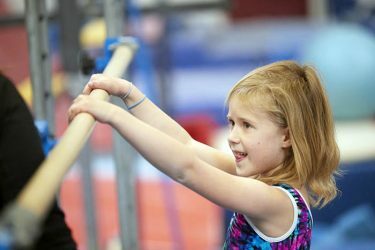 Gwyn enjoys traditional gymnastics and Paige acrobatic gymnastics at their Chandler gym. The Satterlees have become advocates of more services for siblings of those with pediatric cancer. When she speaks of Paige, Leslie’s eyes start to well with tears – the first time they do so in an hourlong conversation. Even though cancer eats away at a family’s energy and happiness, she doesn’t want Paige to ever be lost in the wake that is cancer. 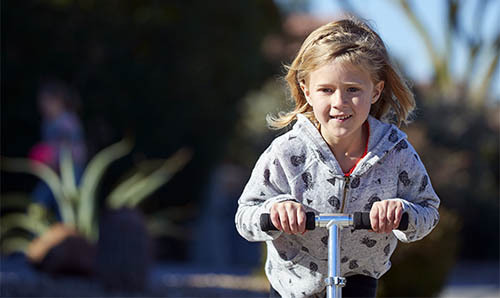 “We’re understanding more about the need for that emotional support and that circle of resources with (Phoenix Children’s Hospital mental health therapist) Jennifer Hamblin,” said Leslie, who also advocates for improving the family programs offered at Phoenix Children’s East Valley clinic. No Child Life representative is on staff at the clinic, and the activities featured at the main hospital are not available at the clinic. For two consecutive years, a Satterlee family friend who owns a bar has hosted a night during which part of the proceeds benefit CCN. Those proceeds funded an activity cart stocked with arts, crafts, games and toys, which make those 8- and 9-hour appointments at the clinic a little better. “Our big push has been with Patti to see if there was anything CCN could do to bring some of that to the East Valley clinic,” Leslie said. CCN continues to serve more than 750 families annually. The organization distributes $75,000 in food and gas cards every year and awards at least $30,000 in scholarships. 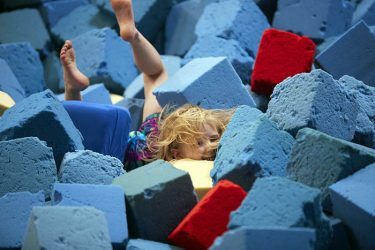 Gwyn takes a dive into the foam pit at her gymnastics studio. The organization also started introducing STEM programs – science, technology, engineering and math – for children who have missed long periods of school because of cancer. This may be Gwyn’s story — “I am GWYN” – but it’s one she shares with her sister Paige. With her mom Leslie. With her dad Galen. With her fellow pediatric cancer survivors. When: 7 a.m. Saturday, March 16. The 10K starts at 7 a.m., 5K at 7:45 a.m. and the quarter-mile Cancer Survivors Walk at 9 a.m. The post-race festival will feature a vendor expo, arts and crafts, and other activities. Cost: $45 through Jan. 31 for the 10K and $50 afterward. The cost for the 5K is $35 through Jan. 31. The Cancer Survivors Walk registration is free and open to cancer survivors of all ages. Register: www.runtofightcancer.com. Online registration is open until midnight March 15. Race-day registration will be available between 5:30 a.m. and the start of each run. God Bless you all. My grandson was diagnosed with Neuroblastoma, stage 4, at 18 months. They have been on this journey for the past year. I’m staying with their 10 year old daughter at their house while they are in New York at Sloan Kettering Hospital. It’s a struggle for them. They have to pay all flight cost from GA to NY plus co-pay on insurance and on and on and on. But our family has vowed to make this work. I wish there was some way to get the attention of the people to recognize the need for funding. Logan was in Memorial Hospital in Savannah for 4 months, 3 in NICU. If the disease doesn’t take their lives the cure will. Please keep fighting for our babies. If you haven’t walked this road you have no idea how this disease destroys your lives.